Taper. The week when forcing yourself to be “boring” and routine is acceptable and welcomed. It’s been a little less routine that I’d like so far but that’s nothing I can’t handle. (I had business trips immediately sandwiched around the Twin Cities Marathon last year and I didn’t die so there’s that!) This week really has been a weird rollercoaster of emotions and thoughts. On Monday and Tuesday, I couldn’t help but think about what this race means to me. Now that it’s later in the week I’m focusing on the little things like foam rolling, sleeping, hydrating, and tying up loose ends before I get on that plane. There’s a big difference between Monday’s emotions and today’s emotions–thank goodness! It’s hard to believe that race day is almost here and I will be on a plane to Boston in a matter of hours. I feel like I’ve mentally prepared for this day for far longer than just this 14-week training cycle. The journey began when I BQ’d at Chicago in 2011. Ever since then, I’ve been thinking about what it would feel like and what kind of runner I would be when I raced from the start line in Hopkinton to the finish line in Boston. I’ve changed so much in 2 years. The first time I ever posted about something running-related on this blog was in February 2011 when I wrote about my decision to train for Chicago, my first marathon. I re-read that post the other day and literally started to cry. I’m not kidding. Full on taper crazies emotions going on over here this week! At this point, it’s par for the course and I’m embracing it. In that first blog post about my decision to run my first marathon, I wrote: “Hopefully this motivated, determined feeling will remain in full-power through October when I put my mind and my body to the test. I have a feeling it will do just that–because when I set my mind (and body) on a goal, there’s no way out of it, no slacking off possible.” Woah there girl! Where’d you get the balls to say that?! Who do you think you are? That girl had a lot of guts considering she hadn’t jumped into a real training cycle yet. The farthest she’d ever run was 13.1 miles and she had no idea what was ahead of her. I know that this positive self talk was just one of the ways that I convinced myself that my first marathon would be a great day to race. I spent literally 8 months giving myself this pep talk leading up to the Chicago Marathon. I don’t think I’ve ever stopped giving myself this pep talk. Running became my obsession 2 years ago and I can’t help but sit here and wonder how all of this happened in such a short amount of time. It’s been one hell of a ride. And I can’t wait to get to that start line in Hopkinton to finish what I started two years ago. 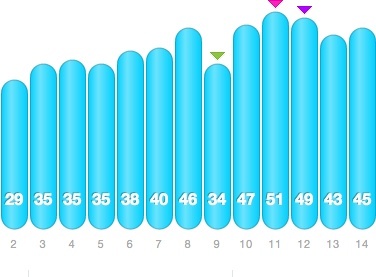 As prep for the race, I’m putting this training cycle in perspective. In November & December, I went to physical therapy for 5 weeks and took several weeks off running because of a weird hip/glute issue. To say that I was nervous about training for Boston beginning in January is a huge understatement. The two weeks off running allowed the minor tendonitis in my hipe/glute to subside but I knew it was still weak. With strength training and the exercises I did in PT, I gradually started to feel stronger. The first few weeks of training were literally just test weeks to see if I could jump into a full-on training cycle. Thankfully, the hip passed that test and we were off and running….literally. I know that if I hadn’t taken that time off in December, I likely would have had a bigger injury on my hands and I would not be racing Boston. (Maybe running it, but definitely not racing.) INSERT BIG SIGH OF RELIEF that that scenario did not happen! This cycle has been different than ones in the past for several reasons. I incorporated more strength and agility training. I treated myself to a monthly massage (that will be routine in the future). I became serious about my nutrition and learned how to fuel properly. I focused on each week’s training, as opposed to looking too far ahead and getting caught up in the next race on the calendar. I trained in the moment this cycle. At this point there’s nothing to do but obsess over my racing plan rest, hydrate, and fuel. I thoroughly enjoy these three activities so I don’t think it will be a problem 🙂 . For now, my goals for Boston are mine to obsess over but if you want to track me on Monday morning, text the word RUNNER to 345-678 and respond with my bib #: 8763. You will also be able to watch the marathon live on BAA.org (just be sure to close the office door and lower your voice while you’re cheering us all on at work!) Flotrack is also going to have a live feed available. For you Boston vets, what wise advice do you have to give a newbie? What should I absolutely *not* miss in Beantown: food, sights, activities? When we went, there was no plan and we just wandered around the city. There was never a dull moment. The city is breathtaking and has such a rich history that it honestly is hard to capture in words here. I remember being in awe of the trees, the cobblestone streets, and all the old architecture. Just soak it all in! What strength training have you done that’s been most useful? I’ve got glute/IT band issues and I want to run Twin Cities in the fall. I’m working with a physical therapist, but I’m always interested to see what works for other runners. Gosh, you just made me all emotional reading this post! I really wish I had run 5 minutes faster last year. 😦 next year! You are one helluva runner and I can’t wait to stalk you on Monday! You should hit up Boston beer works, don’t climb bunker hill or walk the freedom trail. And drink some SA 26.2!!! I smiled the entire time I read this post. Your training cycle has been ROCK. SOLID. You are going to do so well in Boston, Jenny! App – downloaded! GOOD LUCK! you have worked SO HARD! i think that training through this past chicago winter most definitely prepares you for ANYTHING — man, it’s really been the worst! i’ll be cheering for you from chicago! So excited to hang out with you this weekend! You are going to do amazing. You marathon potential is limitless and I am very excited for you! This was such an amazing post, you got me all emotional for ya! I’m so excited for you and race day; you’re going to dominate! Here’s to a great race! Let’s do this! I’m all set up to track you! Go eat at JM Curley while you are in Boston! The food is so good! Like amazing. You are going to rock this race- your training has been executed beautifully! Can’t wait to cheer you on from Indianapolis! I did a post on my two times running Boston Marathon that you may find interesting. There is so much to do and see in the area so make sure to get out and check out restaurants, places to shop, etc. It’s a beautiful area with so much to offer! The Boston buzz is in the air the whole weekend too. 🙂 Enjoy! Can’t wait to read about your experience!